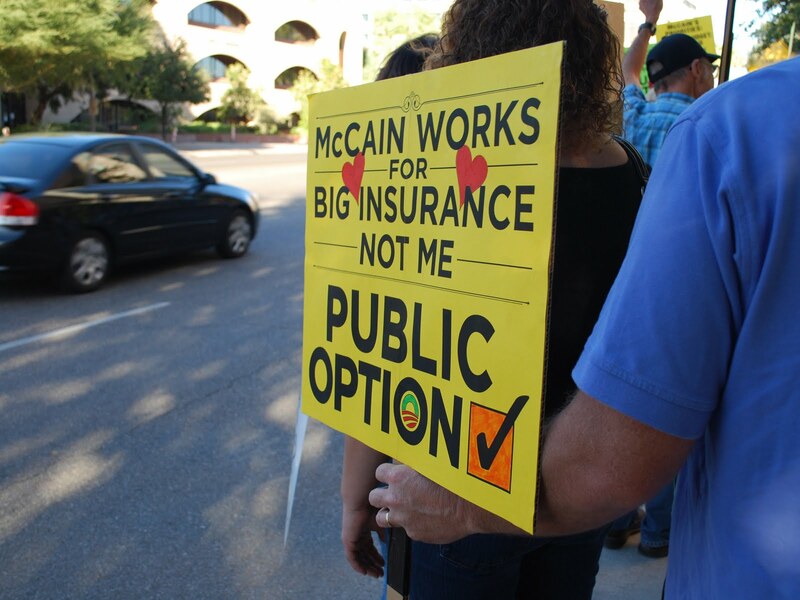 > Wednesday afternoon Move On organized a healthcare reform rally in front of Senator John McCain’s office in downtown Tucson. 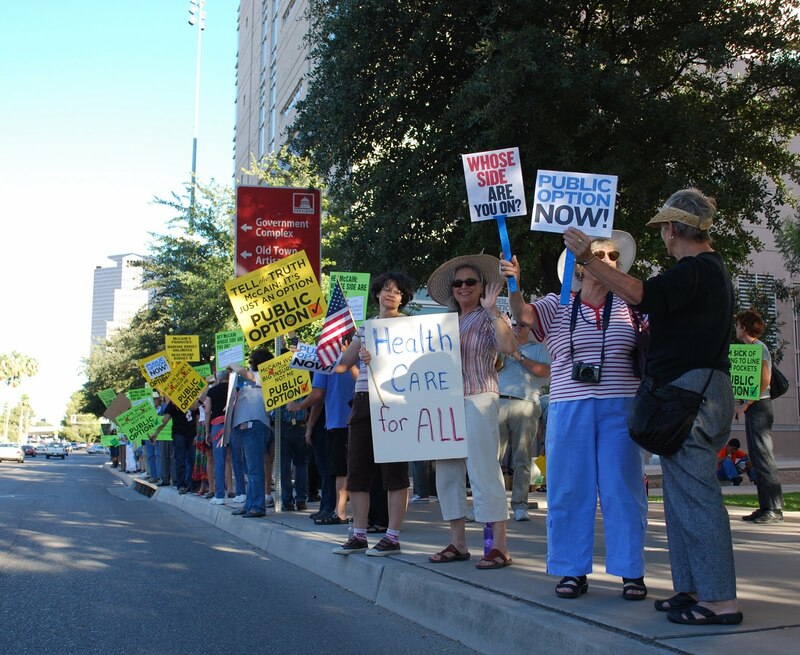 Fifty or so people waived signs and chanted as commuters headed out of downtown in evening traffic. The protesters were looking for their senator and wondering what happened to that “maverick” and his straight talk express. You know– that guy who talked about campaign finance reform years ago? What happened to him? He seems to have forgotten his constituency and dissolved into the mainstream, ultra-conservative Republican Party (along with his partner in crime, Senator Jon Kyl). 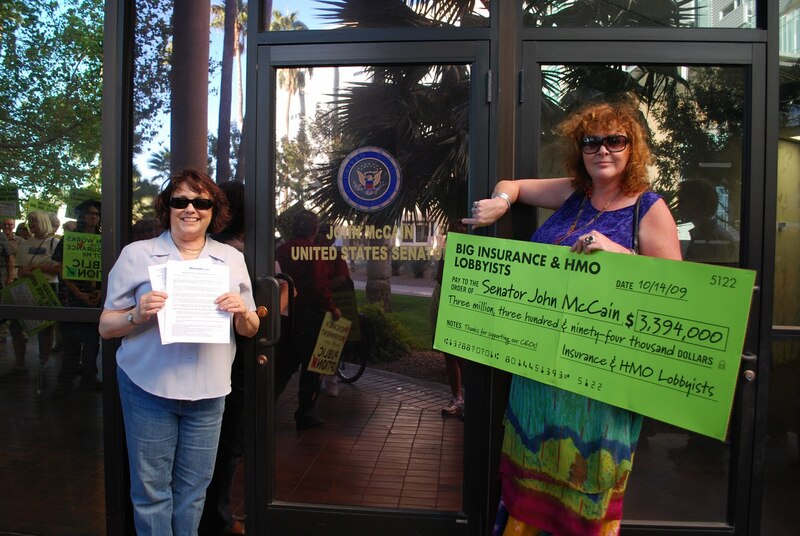 After the chanting, sign-waving, and speeches, the group went to the door of McCain’s office to present him with a $3.4 million dollar check– representing the amount of money he has received from the healthcare insurance industry over the years. You see, John McCain has received more campaign contributions from the healthcare industry in his career than anyone else in the US Senate. 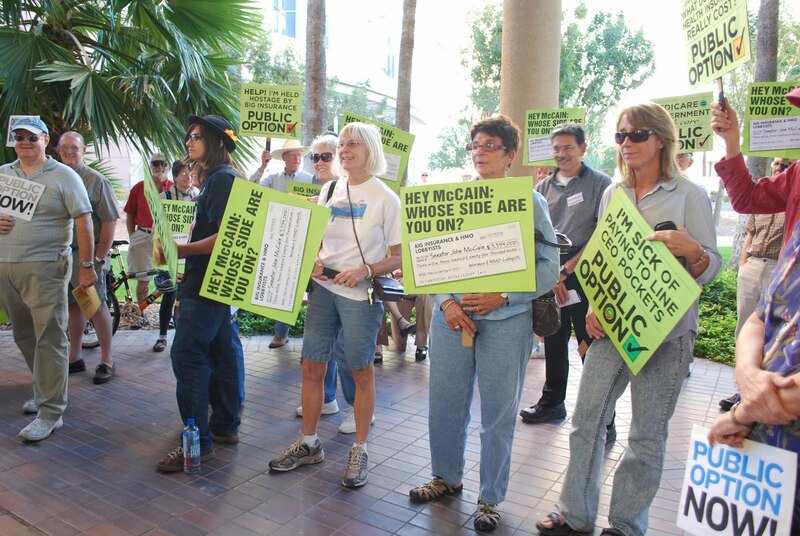 Protesters politely knocked on McCain’s office door, but no one answered. 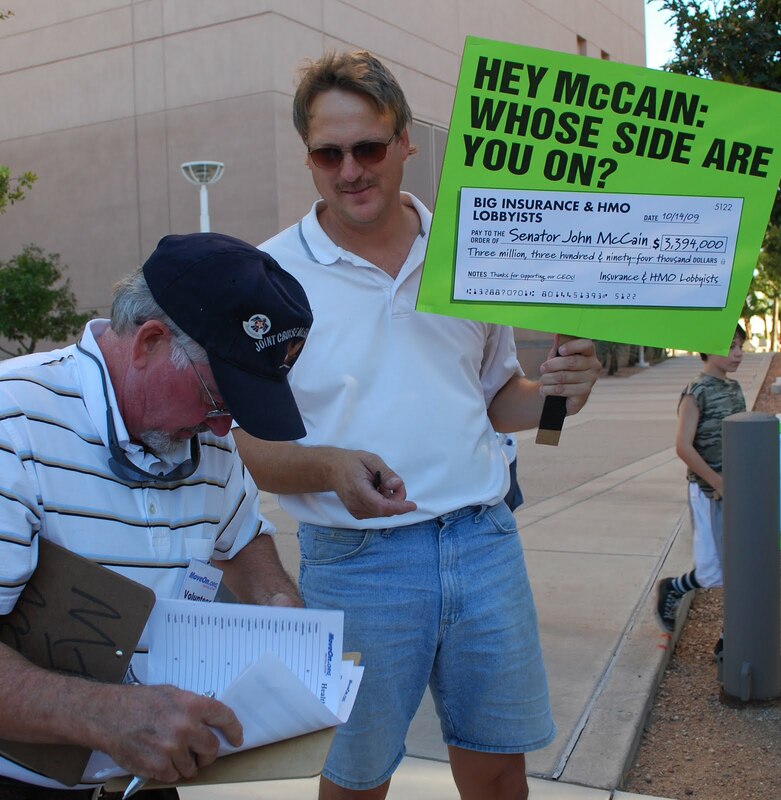 McCain’s constituents were locked out–again– a symbolic gesture given the differences between his stance on reform and the opinions of many in Southern Arizona. There will be more rallies. 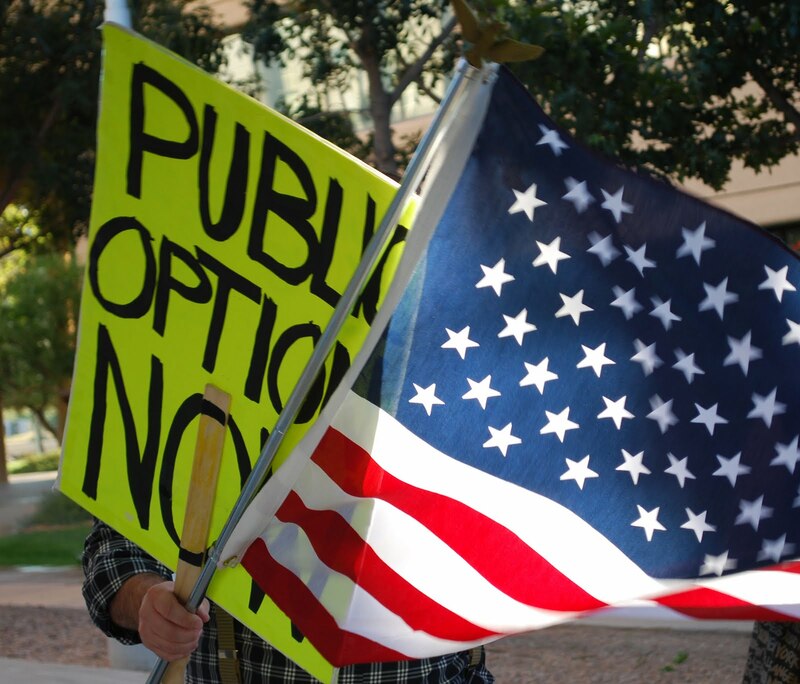 McCain and Kyl, we’re not giving up. 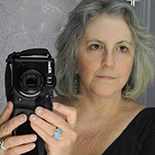 This entry was posted on October 16, 2009 by Pamela Powers Hannley in democracy, Democratic Party, healthcare, Healthcare Reform, John McCain, Politics, Tucson.